It was around 2008 when I got an email from Chic Montes inviting me to take part in the formation of a local blogging community. But I have to decline because this was the time I went back to Bacolod City for personal reasons. 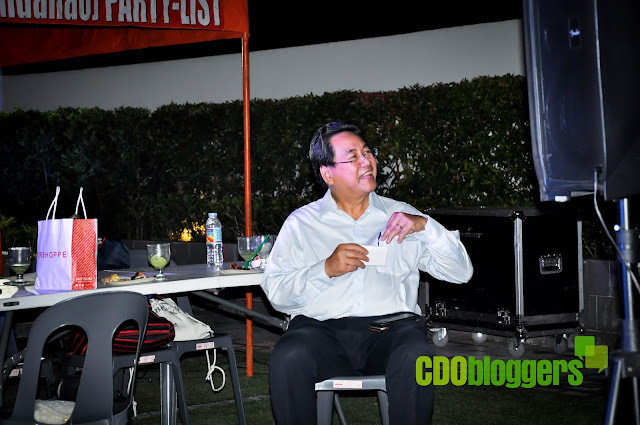 During that time, Chiq Montes, Michael Abonitalla, and many others formed the SEC-registered Cagayan de Oro Bloggers, Inc. or better known as CDO Bloggers. The formally formed the first and only blogging community in Cagayan de Oro City. And from that moment on, knowledge, friendship, and social responsibility abound. The org has successfully promoted Cagayan de Oro to the world. Fast forward to 2018, finally, the year has come for us to celebrate our 10th year anniversary. The planning stage was easy but the execution was a bit of a challenge. But all in all, though it was not perfect, it was successfully executed thanks to the wonderful officers and sponsors who made everything possible! “Rebels in Black & Gold: The CDO Bloggers 10th Anniversary Bloggers Ball” was the much-awaited event for us CDO Bloggers. Just like the food tour we have planned two years ago, this was also two years in the making. And that night, all finally come into completion! The program was hosted by Edelma Cortez (VP for Social Media) and Edu Ragpala (P.R.O.). Both have been very entertaining and accommodating hosts. They provided laughter and smooth transition of the program. We started with a welcoming remark delivered by yours truly. We were very thankful that night because it didn't rain. The night was amazing and the breeze was very cool. Then followed with a lot of raffling off prizes in between programs. We were saturated with raffles because we had a lot of gift certificates to share. Thanks to our generous sponsors: Ororama Supercenter, Centrio Mall, StreetBy, and N Hotel! Then after a while, we had our dinner. Restaurant Damaso gave us a sumptuous dinner by setting up their signature crostini buffet! So far, they are the only restaurant I know here in CDO who does one. So far, I am loving it! The setup is not only delicious-looking, but it is actually delicious!!! And thanks to Smart Communitcations, Inc. through Ms. Judee Chavez, for providing a porchetta which complimented the crostini buffet! As we eat our dinner, we were serenaded by CDO's homegrown band Rockaholic to which the keyboardist is one of the pioneering members of CDO Bloggers - Richard Badlisan. After our sumptuous dinner, Michael Abonitalla, Chairman of the Board, gave a history of how Cagayan de Oro Bloggers came to be. It was followed by a short AVP of photos who CDO Bloggers through the years. While waiting for his name to be called, Cong. Rufus laughed wholeheartedly as he enjoyed our program. Our special guest that night was Congressman Rufus B. Rodriguez of the Second District of Cagayan de Oro City. It was my first time seeing and hearing him in person. And I was totally impressed, aside from his credentials, he was very down to earth and humorous. His speech was not long but very on-point, timely, and very relevant for us bloggers and social media influencers. He was also accommodating as we took group photos with him. After his speech, he ate dinner and continually listened to our program. Every year-ender events, we at the CDO Bloggers, give out special awards to all members. This year was different as we gave out awards to non-members who attended the event as well. And the most exciting part was the announcement of the CDO Blogger of the Year. Just like last year, the winner was taken from the votes of all members. And the winner was CDO Mommy Blogger, Ruby Caberte! Yay! That's me! Thank you so much to all the members who voted for me and believed in me. Thank you so much!!! And of course, we also gave out prizes to the most active pioneer and non-pioneer/non-officer bloggers, the Most Active Youngest Blogger, and several other special awards. The most excited winner of the night was the grand prize raffle winner Ms. Edelma Cortez. She won an overnight stay for two at N Hotel!!! To cap the night off, our current president Ms. Maia Fortich Poblete gave a thankful speech to everyone. She shared how the event came to be, the challenges we encountered, and the thankfulness of our hearts for everyone who attended and supported our event. All of the CDO Bloggers Members and Pioneers! To everyone, thank you so much for making “Rebels in Black & Gold: The CDO Bloggers 10th Anniversary Bloggers Ball” a huge success and a memory we will forever cherish!! !